Depending on the sort of work you do, a skid steer can be a mission-critical piece of equipment. While you might prefer to buy your heavy equipment — even if it means applying for a loan or negotiating a financing agreement — another viable option to consider is renting. 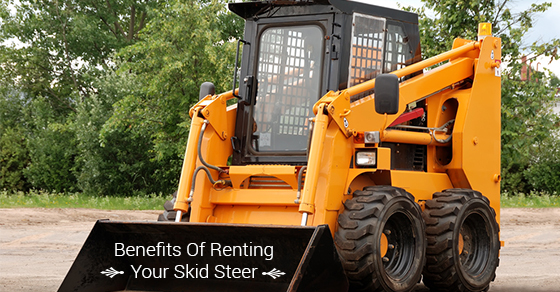 There are a lot of reasons why renting might be a better option than buying when looking for a skid steer. Whether you’re concerned about the state of the economy, want to limit the outflow of cash, or desire to have access to the newest and best equipment, rental might be a great solution. What follows is a run-down of 4 benefits of renting your skid steer. The information will help you to decide if renting makes more sense than buying for your organization. One of the benefits of renting skid steer equipment is that you’ll be able to pay a relatively low fee, compared to the cost of buying, to use such machinery. You can also choose when to rent. If there are high-demand periods in your fiscal year, you can rent a skid steer – and you can return it when demand dries up somewhat. This means that you can scale up and scale down depending on your needs. Renting rather than buying your skid steer means that you won’t have to take on the costly and labor-intensive task of performing maintenance and repairs. The renter will take responsibility for keeping your skid steer in good shape so that you can focus your energies on running your business. You’ll also be able to gain access to the latest equipment since many popular renters regularly upgrade their stable of heavy equipment. If you’re considering new business opportunities, renting a skid steer provides a way for you to reduce your risks since you won’t be stuck with more equipment than you need should things not pan out as you had hoped. Being able to rent for a short-term period will lessen your losses in the event that explored business opportunities don’t work out. Because you’ll be able to rent for different durations of time — such as daily or weekly — you’ll be able to try out different types of skid steers. This will be useful in the event that you actually want to buy one in the foreseeable future, since you’ll have had the chance to test some of them out beforehand. As you can see, there are various benefits to renting rather than buying. Assess your company’s needs and decide whether or not renting might make sense in you specific situation.